It’s finally time to buy that new plasma cutter! That’s great, once you get one you’re going to wonder how you ever lived without it. Plasma Cutter Reviews are helpful to determine the right one you’ll need. Right below here, you’ll see a quick chart I put up if you’re in a hurry. These are the top-selling brands with the best plasma cutter reviews from Amazon. You can go there and get an idea of what’s available and what specs are on the cutter. The entire specs sheets will be thoroughly gone over, so you know what to look for when reading along. As you can see in comparison chart the top machines of 2015 and 2016, and for many reasons. So take a look further at our reviews and see what one might be best for you and your shop. Keep in mind, some are going to be more portable than others, but we make sure to the point that out. Another thing we’d like to point out is, all these products are available online. Customers who have bought their machines through us have been pleased with everything from shipping to warranties. If you have further questions or comments, please reach out and talk to us. What is plasma cutting? Well, it is a convenient tool to have in the shop. Cutting metal is not easy to do, and apparently, you need some hard-core machines to do it. The beautiful thing about a cutter is, its small enough to haul around and you won’t have to hook up all the extra’s to get it to work. This machine serves many needs in a shop; fabricators use this tool every day. Artist uses this to create art by cutting metal and welding them together. If you need to cut steel or many other hard metals, this is the tool you need! Plus it’s portable, and it’s cheaper than using Oxyacetylene. Let’s be honest here; we could probably cut anything if we needed to by just heating the crap out of it and then whacking it with a sledgehammer. But to get those beautiful, clean cuts that you’d be proud of, you need this. And that might be the argument I have most with younger dudes who come into the shop, but none the less, I just show them how it works, and they are hooked! A good one will be able to cut through hard metal without a problem. The size of the metal that it can cut will make a good cutter as well. Can it cut through 1/2″-3/4″ steel, and how fast and accurate can it do that? Price is another factor, do you get what you pay for? Maybe. I know tons of happy people who paid $425 for a good machine, and they are thrilled. I also have a bud, who paid big bucks for his over $1400. And that’s great too, he uses his in his auto garage daily, loves it! Things to look for, and I’ll go through each down below. So let’s take a look at some of the features that come with a cutter. Depending on which machine you choose, you may have to configure the wiring. What this means, is your machine can be wired for 110 or 220v. But your shop or garage at your home might not be wired for 220v. So, keep that in mind. But most machines will come with 110 or 220, and you will have to screw the wires into the body of the cutter. Or the machine might be a screw in, a beautiful and easy way to go. But some tools come wired to 220v right off the bat, they may come with the 220 to 110 adapter, and you can just plug right in a go. Look for a multi-voltage plug (MVP) to be safe if you’re not sure. A dual meter in the front of the machine will allow you to adjust to the proper amps if whether you’re using 110 or 220v. If you are using your machine a few times a week than MOSFET will be okay. If you plan on using your machine more than that, IGBT has been known to hand the amp & temperature requirements of higher amp machine. Built-in cooling system for the machine is essential for the machine to work and the overall longevity. This is a significant feature not to overlook when reading the reviews. Make sure the machine can cut your desired thickness. If not, you could be in trouble and not be able to cut all the way through that piece of steel. The max cutting thickness you need is up to you, and it will be the difference in money when you purchase. Possibly $100 for more max depth. So, be sure to know what you’re going to be cutting before you start looking. The torch holds the consumable electrode in a chamber where gas heats up to form a plasma. The tip of the torch holds the constricting nozzle with an opening for the arc and plasma to pass through. As the arc and gas pass through the opening, it forms into a more constricted and focused column that increases the velocity and heat of the arc. Plasma Cutting consumables, machines come with starter sets, but you’ll want to grab some extras just to have in stock. Your new machines will come with a new torch as well. Some flames are customized for your fitting. The torch trigger can be moved to your liking. It can be used in thumb and finger positions. Torch heads are usually low profile for tight spaces. The machines run on compressed air. So you will need to add a compressor with around 70 psi, and the machines will run beautifully. If you don’t have a compressor, you can pick one up for under $75. 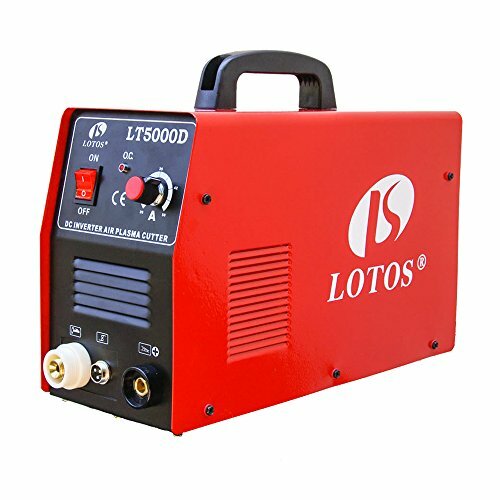 The Lotos 50A: This inverter cutter, made by Lotos Technology, cuts metals such as stainless steel, mild steel, alloy steel, copper, and aluminum up to 1/2 inches thick. The max severance thickness is 3/4 inch. Including the handle, the cutter is 15 in by 6 in by 12 in. It is relatively light at 22.5 pounds and is powered by an AC or DC. The cutter has automatic dual voltage, (110/220V) and a double frequency (50/60 Hz), as well as an advanced cooling system. 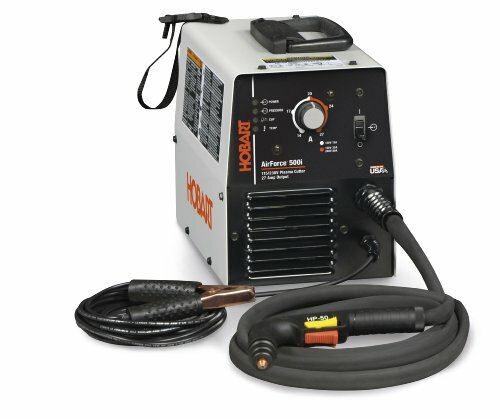 The package includes a plasma cutting torch, a ground clamp, and cable, an air filter, air hose connections an air hose, along with a one year warranty. Customers were satisfied with the cutting power and friendliness of Lotos Technology. For lighter work on thinner pieces of aluminum and sheet steel 110V is fine, but for heavier work, the 110V will blow, and a 220V is required. The various parts are straightforward to get cleaned and replaced when needed, although the consumables tend to wear out quickly. Due to its low price, about $400 on Amazon, it obviously is not comparable to more expensive, higher quality models, but it does get the job done. This machine is geared a more towards beginners and hobbyists, and useful for home projects. The Hobart Airforce 500534 250ci: This Hobart is powered by the standard household current, and is designed to cut up to 1/4 in of mild steel, or steel containing a small percentage of carbon. However, it works best on thinner pieces of metal that take less time to cut. 1/8 inch metal can also take some time, but it will result in a clean break. The cutter is 10 in by 7.5 in by 13 in and weighs in at 27 pounds. The package includes a power cord (7 feet), a work clamp (16.5 feet), a 115 VAC plug, a cable management strap, extra tips, and a Hobart limited warranty. Overall, it weighs a hefty 31.5 pounds. It uses electricity and compressed air to cut faster and more precisely through steel, aluminum, and other conductive metals. Make sure to use a minimum of a 20 amp and a 110 breaker, or the product might not work well or safely. One feature that customers especially liked was the lack of adjustments that had to be made before cutting, and the built-in air compressor was also well received. However, the ground cable can be a little inflexible. In general, this product is best suited for the home hobbyist. 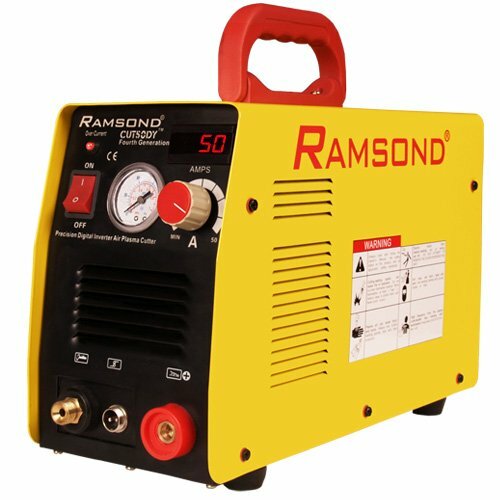 The Ramsond CUT 50DY: This product is also automatic dual voltage, (110/220V), and a dual frequency (50/60Hz). It has an integrated display of current amps and a pressure gauge display. The cutter is designed to handle up to 3/4 inch of various types of metal with a maximum severance thickness of 1 inch. The product is 14.2 in by 6 in by 9 in, and weighs an incredible 19 pounds. It is an upgraded version from a previous line of Ramsond cutters and has a foldable, insulated handle and an advanced cooling system. The package includes a 10-foot hose, extra consumables and has six pieces total, as well as a one year warranty on parts and labor. For this product, make sure to get a strong air compressor, and while it cuts tips effectively can wear out somewhat fast. It cuts very cleanly and quickly through 1/2 inch metal, but thicknesses higher than that, while still cuttable, tend to produce messier edges. Overall, customers were pleased with the power contained within the unit for the price, slightly more expensive than the first one but still relatively cheap. 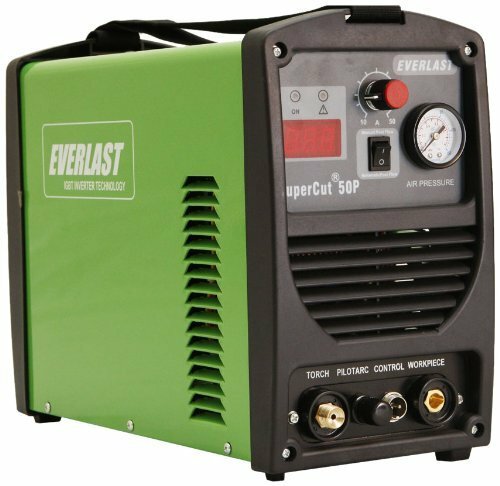 The Everlast SuperCut 50 Inverter: Features adjustable air pressure and post flow, in addition to a pressure gauge and light indicators. It has automatic dual voltage and dual frequency and is designed for a maximum cut thickness through most metals, of 1 inch, although it is a little slower at that thickness. It comes with items such as cutters, a torch, a ground clamp, extra electrodes, and nozzles, among others. The cutter itself measures 19.5 in by 14.1 in by 13.2 in, and weighs 25 pounds. It is powered by a DC and has a 5-year warranty. It has an average of 3.9 out of 5 stars. This particular product works best with a 220V but struggles at a 110V. One complaint was that extra nozzles and consumables by Everlast were not readily available at welding supply shops, so that’s something to keep in mind. There was also an issue of loose bolts, but that was on readily fixed, and customer support at Everlast was deemed helpful and knowledgeable. The cutter performed well overall even at thicker 3/4 inch pieces and was also easy to assemble. Inverter-based design and reliable technology pack a lot of performance into a very portable package. 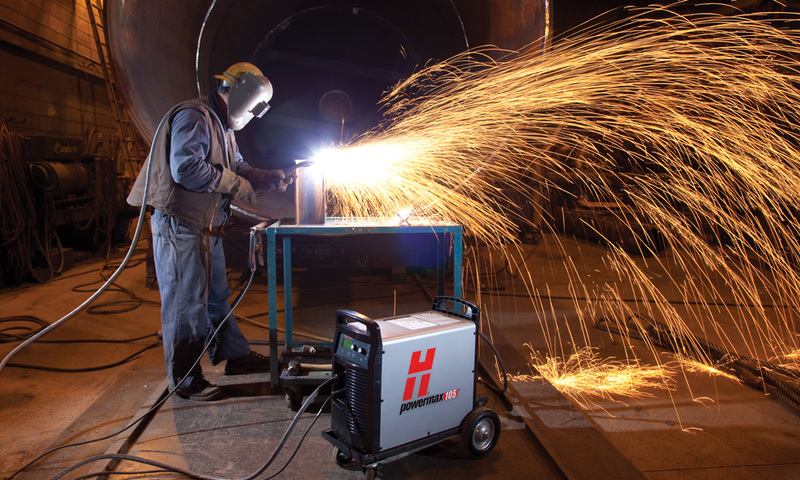 An economical plasma cutting system for all conductive metals. This power source adapts to your work site by operating from either 115 or 230 VAC power through standard household outlet using the Multi-Voltage Plug (MVP). The Hobart 500i: This Hobart model, an Airforce, is definitely a little pricier. However, it is also quite effective and has a high rating. The cutter is 14.2 in by 8.2 in by 11.2 in and weighs 27 pounds. It will cut any conductive metal with a maximum thickness of 5/8 inches, although it works better at a slightly lower 3/8 inches or 1/2 inches. The cutter has a post-air cooling system, wind tunnel technology to prevent damage to internal components, and thermal overload protection. The package includes a newly designed torch, a multi-voltage plug (115/230V), extra consumables, a heavy duty work clamp, one airline fitting, a power cord, and a cable management strap. Also, it also has a standoff guide and owner’s manual, and there is a warranty of 1/3/5 years. Customers were happy with the multi-voltage plug and the cutting power for the specified thicknesses. The set up was also simple, with the cutter only needing to be plugged in, connected to the compressed air supply, grounded, then started. Although it takes time to learn how to use, it will perform consistently well. However, because of its price, it should be used by more experienced people. As we add more products, they will be added here. Check back often to read more plasma cutter reviews. If there is a machine you want us to feature, let us know. Or just leave a comment about your machine, we’d love to hear from you. But thanks again for stopping by to read our guide. Feel free to Contact Us for more information. And thanks again for Stopping by! Any thoughts on how thick I could cut using the Hobart? Something like 3/4 to an 1″. But we’ve gotten thicker with other metals. Worked well and it cut pretty clean. 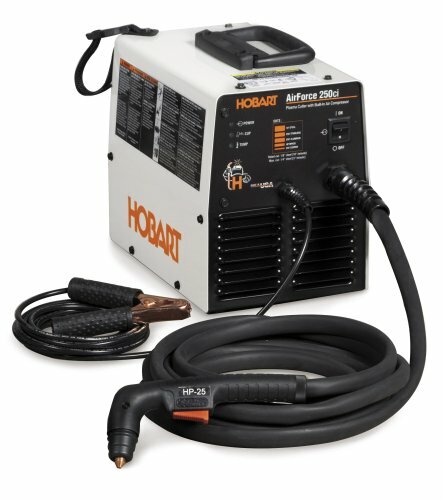 We’re putting together a Hobart plasma cutter review, check back in a few days. We trying to upload videos and my son needs to help! Had the lotus for a few years, good but looking to upgrade. Any thoughts on a miller plasma cutter, do you have any reviews?